Syntax is defined as a set of rules for assembling units of any type into a larger unit, e.g. the temporal arrangements of acoustic units within song (Marler 1977). As a prerequisite for using combinatorics (“making infinite use of finite means”), the advantages of syntax are best illustrated in the vast expressive power of human language (Chomsky 1965; Jackendoff 1997). Hence, the transition from non-syntactic to syntactic communication was a keystone in the evolution of human language (Nowack 1999; Hauser et al. 2002, Fitch 2005) because syntax allows larger repertoires and the possibility to formulate new messages (Nowak et al. 2000). One can distinguish between ‘phonological’ and ‘lexical’ syntax (Marler 1977, Jackendoff 1999), with phonological syntax referring to the rules that define the assembly of smaller vocal units into larger ones, and lexical syntax to the corresponding changes in meaning. Saccopteryx bilineata roosting on a tree (© Stifter). Phonological syntax is frequently observed in animal communication, especially in the learned songs of birds (Kroodsma & Miller 1982, Marler 1984) and whales (Payne & Payne 1985, Noad et al. 2000) or the calls of primates (Clarke et al. 2006, Crockford & Boesch 2005), whereas the evidence for lexical syntax is rather scarce (Kako 1999, Zuberbühler 2002). At least in birds (Balaban 1988, Honda & Okanoya 1999), the complexity and diversity of song syntaxes can evolve through sexual selection if females prefer complex songs. 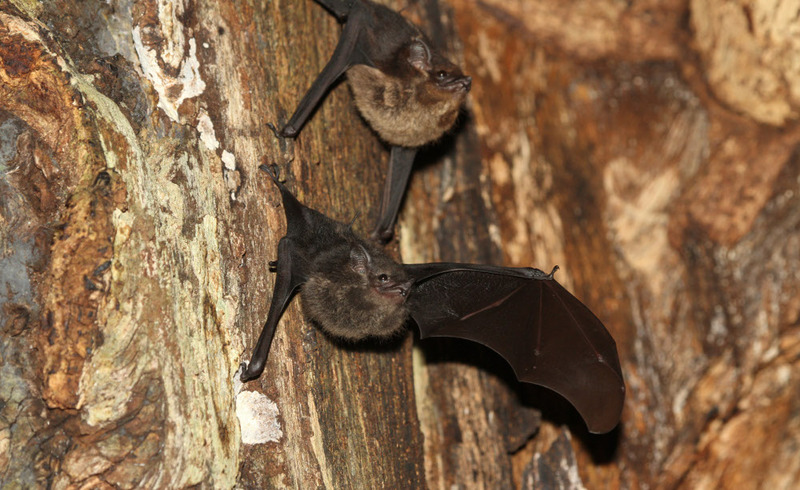 In bats, little evidence for phonological syntax exists (e.g. Kanwal et al. 1994, Esser et al. 1997, Bohn et al. 2009), even though it is probably fairly widespread, especially in species with complex vocal repertoires. The greater sac-winged bat Saccopteryx bilineata is well suited for studying syntax in bat vocalizations because its vocal repertoire is well described, complex and consists mainly of multi-syllabic vocalization types that are uttered in distinct social contexts (Bradbury & Emmons 1974; Behr & von Helversen 2004; Knörnschild & von Helversen 2008) and acquired through vocal production learning (Knörnschild et al. 2006; Knörnschild et al. 2010; Knörnschild et al. 2012). Male Saccopteryx bilineata produce long and complex courtship songs consisting of various distinct syllables. The repertoire size of the most common syllable type, the trill, differs between males and is positively correlated with male reproductive success, indicating that female S. bilineata prefer songs with highly variable trill syllables (Behr & von Helversen 2004). Based on this finding, we want to investigate the structural rules underlying courtship songs, i.e. determining whether the sequence of syllables in courtship songs is defined by syntax or by random improvisation. We will link the assessed complexity of courtship song performance to male reproductive success. 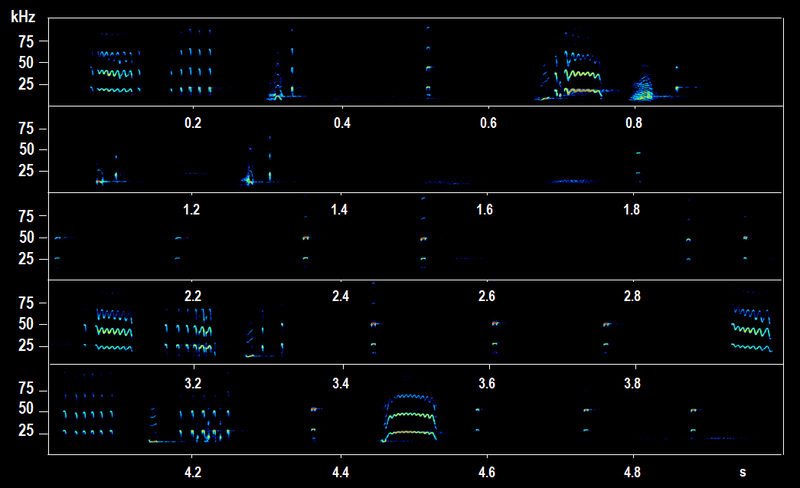 Courtship song excerpt of a male Saccopteryx bilineata (© Knörnschild). In Saccopteryx bilineata, pups of both sexes produce long babbling bouts during the acquisition of the vocal repertoire. In these babbling bouts, adult vocalization types are combined into supposedly meaningless strings of vocalizations (Knörnschild et al. 2006). We will investigate whether babbling is defined by syntactical rules and whether these rules change as babbling bouts become more complex throughout the pups’ ontogeny. Babbling bout excerpt of a Saccopteryx bilineata pup (© Knörnschild).